A Foobler for rhinos . . . What an opportunity after our Kickstarter launch to get to introduce something like this into a real world situation. We were very fortunate to work with the Vice President of Animal Wellness at the San Francisco Zoo on a special project to develop habitat improvements that encourage a wild animal's foraging and feeding behavior. 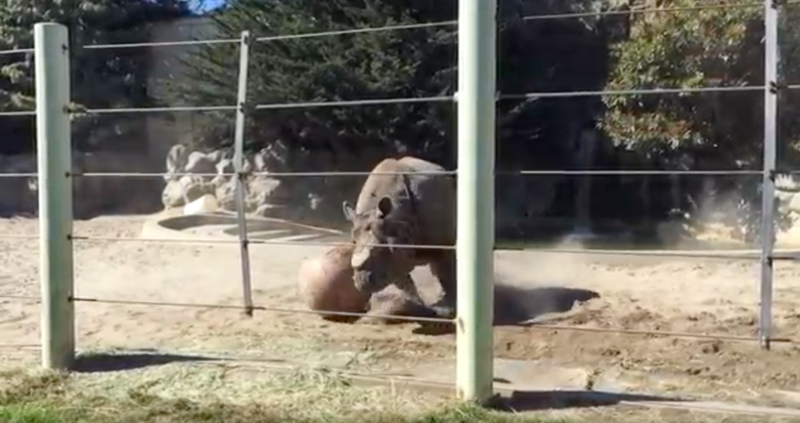 We built a special Foobler scale mechanism into a 30-inch play ball used for animal habitat activity and, just this December, Bethany Krebs completed and published her study at the zoo with their black and Indian rhinos, Boone and Gauhati, after several months of research. It will be in the journal of Animal Behavior and Cognition, published in a special issue this February, 2017. Many thanks to Bethany for managing this project and our prototype, and to Jason Watters, department head. We look forward to being involved in more of the study as we complete the next Foobler for further research with the rhinos and plans with other wild animals that could benefit from feeding enrichment tools to improve habit life and experience. Newer PostPITCH Design and L'chic Pets at the CIPS, Hong Kong 2016!